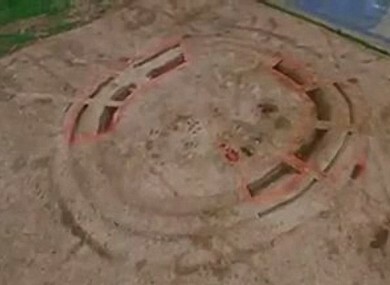 LOCAL HISTORIANS HAVE hit out at plans to demolish a Waterford ring fort that dates back over 5,000 years. US firm West Pharmaceutical Services began building a manufacturing plant on the Knockhouse site earlier this week. The tri-vallate ring fort will be cleared during the second phase of the development, which the company says will deliver about 150 new jobs once the factory is opened in 2018. While company-funded archaeologists will record and preserve any valuable artefacts found on the site, the rocks supporting the ancient monument will be levelled to make way for the new plant. As construction on the land gets underway, local historians have established a new Facebook page to raise awareness of its archaeological importance. “It’s an incredible site,” local historian Chewie Cusack told TheJournal.ie. Only about 3% of Ireland’s ring forts are tri-vallate, which makes this place quite unique. It should be protected or at least left as a green area during construction. Cusack said he was disappointed that Waterford City and County Council, which approved the multi-million euro development, had allowed “commercial interests” to override concerns about the site’s preservation. Lar Power, the council’s director of economic development and planning, told TheJournal.ie that it was “fully supportive of the resolution of the ring fort at Knockhouse”. This site has been zoned for strategic industrial development for many years in the full knowledge of the presence of the ring fort. The work being completed is to fully resolve the site and record the findings. He added that the development “has the full approval of the National Monuments Service, and is being carried out under full supervision and in accordance with best practice”. Emily Denney, a spokesperson for West Pharmaceutical Services, confirmed that local authorities had sanctioned the land as a strategic industrial site. The company agreed to pay for archaeological work on the ring fort, which it was aware of before the site’s purchase, she said. Denney told TheJournal.ie that the National Monuments Service had issued the company with a licence to demolish the ring fort, while recording and preserving any artifacts found on the land. A process of post-excavation analysis will be carried out before a final report on the excavation will be shared with the public. We hope this information will add to the public’s knowledge of and appreciation for Waterford’s rich archaeological heritage. Email “Waterford historians unimpressed by US company's plan to clear ancient settlement”. Feedback on “Waterford historians unimpressed by US company's plan to clear ancient settlement”.